In a business, not far from you, two managers chat by the coffee machine. So Jane’s experience in her new job followed that often used ‘sink or swim’ model. And she left. Jane’s boss said he was disappointed with her progress. And who hasn’t felt that from time to time? But if you find yourself moaning about a new hire’s performance, it may be time to look inwards a little. Have you done everything you can to help them succeed? Jane was hired for a reason. She had the talent, personality and skills her boss was looking for. But that is not enough. The experience she has over the next few weeks will impact how successful she is. So, it’s in everyone’s interest to make those first weeks great. Of course, she has a major part to play in her success but you need to set her off in the right direction. Time invested in the new hire experience will be repaid in benefits. The study also goes on to stay that 90 percent of employees decide whether they will stay at an organization within the first 6 months on the job. And that onboarding employees during their first year of employment increased retention rates by 25 percent. 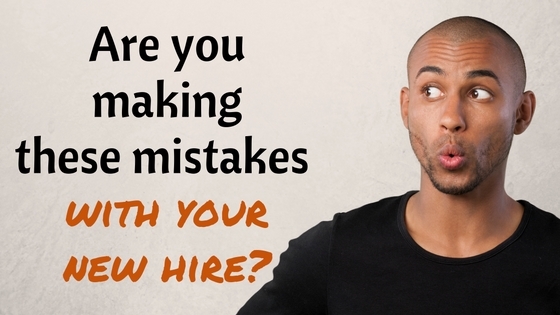 What opportunities in the selection process does your future new hire have to get a feel for the company? A few questions at the end of the interview? Sure, they would have researched your company by reading the carefully crafted words on your website and social media. They may have looked you up on Glassdoor to see your reviews. But let’s not forget. Just because a company has great reviews doesn’t necessarily mean it’s the best choice for everyone. The environment, the demands of the job, the style of management – we all need different things to be successful. So give your new hire the time to look around and talk to some people. A ride in the elevator and a walk across to the interview room is just not enough. Sit her with someone who is doing a similar job. Invite her out for lunch with the team. Set her a mini project to do to see if she likes the work. I was talking to a friend who had been through a thorough selection process recently. He felt like they wanted him to make the right choice too. Do you know what he said the best thing was about his first few days? There were no surprises. He knew he had made the right decision. Start your relationship with your new hire with her feeling like she has made an informed choice. 2. Onboarding starts too late. They make the offer. It’s accepted. And then nothing. Apart from the HR paperwork, the new hire is left alone until her first day. She starts having doubts. Maybe her old job isn’t so bad. She will miss her colleagues. What if she is bad at her new job? Enter stage left a counter offer from her manager or another job offer – BOOM – that could be the end of your relationship. And you have to start all over again. Consider your new hire a member of the team from the moment she accepts the offer. Invite her over for lunch or drinks. Assign her a ‘buddy’ to help her through the first few weeks and introduce them before day one. (Phone calls are fine if face to face isn’t possible). Call her and tell her what you have planned. It feels good when you know people have been preparing for your arrival. First impressions are CRITICAL. What is she going to tell her family when she gets home tonight? That nothing was ready for her? No one knew who she was? She sat around most of the day until someone had time to chat to her? If so, you have a problem. Plan out a structured first day. Your aim is to have her leaving at the end of the day with the same level of excitement as when she started. 4. No objectives are set. Talk through the objectives for the first month, three months and six months. What will success look like at those checkpoints? You will both have something to aim for and will be able to assess how well she is doing. On that note, make sure your expectations are realistic. The huge backlog is your problem not hers. She get it done even with 30 minutes of training and an encouraging smile. Let her get her head around how things work. Her progress will then be faster than if she has to figure it out from day one. She’ll sort out that backlog, just be a little patient. I’m sure she’s met the team but have you helped her build a wider network? Set up time with the other departments she will interact with. Help her build some valuable relationships. We all know how much faster and easier work gets done when you have a rapport with all the people involved. Day after day of online training. Watching and listening. And wondering what made her leave a job where they were useful, to come to a place where she just sits with headphones in her ears. Mix up her days with training, meetings and figure out a way she can actually DO stuff. Make her feel useful. I know you’re busy but make sure you check in regularly with your new hire. Find 10 minutes each day for the first week and then a weekly one to one after that. That should make sure you catch any concerns before they are being shared with you as you receive the resignation letter. Help them understand why they are doing all this. Where does their job fit into the company? Who does their work impact? What are the hopes and dreams of the senior leadership team? Make sure you take time to recognise that they are making progress because they may find it hard to recognise it in themselves. A ‘thank you’ can go a long way to someone that is desperately trying to find their feet. A new job naturally takes people out of their comfort zone. Your job is to make them feel like they are in control, making a contribution and like they belong. And you want to do that as soon as you can. The easiest way to avoid these is to put yourself in her new, shiny shoes. What would you like your experience in a new job to be like? According to the Wynhurst Group, 22% on new hires leave within the first 6 weeks. It’s really worth getting this bit right.